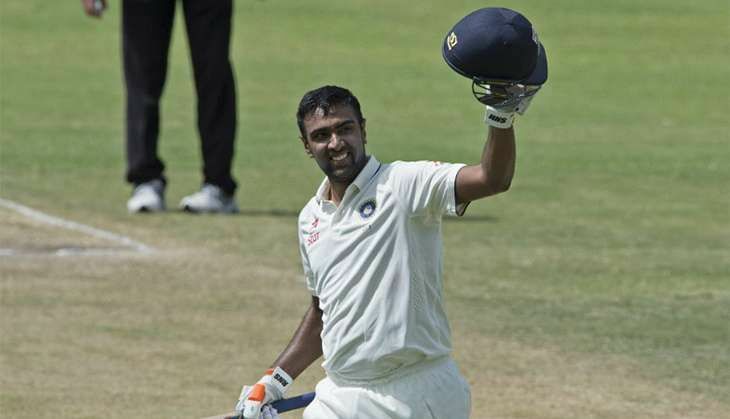 A third Test hundred in his kitty, India spinner Ravichandran Ashwin has expressed a desire to bat at number six for the team, which has been his long time goal. Ashwin (113 off 253) struck his third Test ton, as he along with skipper Virat Kohli took India to 566 for eight declared on day two of the first Test against the West Indies. "I've always wanted to bat in the top seven for the Indian team, which is a long-time goal that I have to try to strive to get better at," said Ashwin at the post match press conference. "I need to thank Anil Kumble and Virat for having the confidence in me to be pushed at number six. There have been times in the past when I've played really well and haven't really got the promotion. This really says a whole lot of things about me. "Kohli called me in the morning and said 'you'll be batting at six, ahead of Saha', which is a big boost to my batting confidence. I had worked on it over the past one month in Chennai with my coach and I'm very happy with the way it's come out," he added. Talking about how he has improved his batting, Ashwin said, "First things first, Sanjay Bangar worked really closely with my stance for the last 12 months. It has been a challenge. I used to be extra side-on and I had to open myself a little bit. That change is very effective. I've not driven straight down the ground for a very long time. That is a pretty evident one. "The other things like my initial movement had to be sorted. It was a process for like 10-12 months, and on the way I did lose a few innings as a batsman as well. I've never left so many balls. Ajinkya Rahane told before the Test match about batting 200 balls, my aim was to bat 150 balls and try and see where I get," he explained. "In between, I played an over from Gabriel, which was a bit loose, and Kohli came up to me and said that is what you need to avoid in Test cricket to be more successful. I really thought I left really well and knew where my off-stump was. It was about batting time more than runs for me this time." Asked if he liked batting against West Indies, the spinner replied, "That's because I've got more time to bat against them. Whenever I've gone in, I've had a batsman to play with. All the times I made a hundred. Once, I had Rohit, and then I had Virat and again Virat now. That's an important factor for a batsman lower down to get a hundred. "And obviously, this game I batted at six so that gave me ample time to try and play it out. Yes, I have got runs against West Indies, and if you start getting a liking towards a team, you have that inside factor, which tells you that you can do it again." The core of India's run scoring was 168-run partnership for the fifth wicket between Ashwin and Kohli, who became the first Indian captain to score a double century overseas. "When I walked in and started batting, I felt like Virat was hitting a few shots that were almost impossible for me to connect. And that is the sheer brilliance of how Virat has been batting over the last year or so. He's just playing a few shots that make the bowling look ridiculous. I should say those shots are out of ordinary shots." India had reduced the West Indies to 31 for one at stumps on day two and Ashwin bowled a few overs before the close of play and got some sharp turn. "I think it's a good batting wicket and you'll have to earn every wicket. You'll have to prise them out. Kraigg Brathwaite and the likes of Darren Bravo...they bat pretty deep as well. We'll have to prise each and every wicket and see if we can actually go the distance and maintain the intensity for every hour. "From here on, we have posted a score and we need to get them out twice. It's about trying and retaining the intensity and going after every wicket time after time. I bowled a few overs, it looks like there might be a little bit of grip but it's a long process," Ashwin signed.